Blogger, also known as Blogspot and WordPress are two well renown blogging platforms in a very competitive industry. However, there can be only one winner. By May 2018, WordPress had 30.7% of all online websites while Blogger had only 0.8% of all websites. Besides that, more than 75 million people and brands globally are using WordPress to promote their online businesses. Most of the big international organizations such as Google Ventures, Mozilla, Facebook, NASA, eBay, CNN to mention just but a few are also using WordPress. Decided to start with self-hosted WordPress? Get 60% OFF when you sign up for one of the best hostings for WordPress, Bluehost. Blogger is a blogging platform that is owned by Google. It is available free of charge, has enough space for publishing much data on the web and sometimes reliable. Google runs this platform and therefore, you do not own your content once you publish it on Blogger. Google reserves the right to shut your blogger blog down or deny you access to your blog anytime. WordPress, on the other hand, is a blogging platform that is provided by WordPress for you to host your website. With this platform, you can build, install, run and self-host a blog with your domain name. You own the website and therefore you have the right to run it as long as you want and shut it anytime you want. Most importantly, you are the owner of your content, you have full control of the kind of information shared on your site and you can share your information with a third party. It is important to take note that in this article we are doing a comparison between blogger and the self-hosted WordPress.org and not WordPress.com and Blogger. The comparison is based on each platform’s services and features which are further subdivided into pros and cons. Though both platforms have great features, the best blogging platform for an affiliate marketer might not be the best for a blogger. Therefore, depending on your needs, you will choose a platform that best suits you. Blogger is a platform with very limited tools which enables you to perform only limited functions on your site. The things that you are able to do on your web are limited by the tools available. There is no way through which you can go beyond what is already provided. WordPress, on the other hand, is open-source software. This gives you the freedom to add extra features. It has numerous plugins which allow you to extend and modify the default functions to meet your website’s needs. For business websites, WordPress beats Blogger hands down as the best long-term platform for serious business people such as affiliate marketers. Transferring your web from Blogger to another host is an uphill task. When you do this, you stand a chance of losing your data, SEO ranking during the move. If you are using WordPress on the other hand, you can transfer your WordPress website to whichever host you want without a problem. It allows you to change your domain name, change host and move your web to other content managers without risking your content. WordPress clearly has many advantages over Blogger in every respect. Why should you do something twice when you can get it right the first time? If the aim of you starting a blog is beyond a private online blog, Blogger is not meant for you. WordPress is a better option for every indicator. Blogger has an advantage of the giant Google’s robust security system. For this reason, if you are using Blogger you will have no thought about managing your server’s security resources, creating backups or even securing your blog. All these will be done by Google on your behalf. WordPress is equally secure. However, because it is a self-hosting platform, it is paramount that you take care of your website’s backup and security. The good news is that WordPress has plenty of plugins which will make this exercise a simple one. Since WordPress is very popular, it makes it a major target by many hackers. Most of its users make their websites vulnerable by not updating their themes, plugins and the whole software as a whole. But a good hosting provider should take care of all this for you without any additional cost. 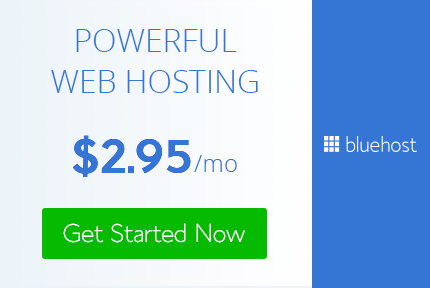 Sign up to the best WordPress Host: Bluehost. On one hand, Blogger has very limited support. It has a basic user forum and documentation. Therefore, when it comes to supporting, Blogger has very limited choices. On the other hand, WordPress has a robust and very active community support system. They have an IRC chat room where you can get instant help from WordPress’s experienced developers and users, community forums and online documentation. Besides this, there are several other companies that are giving premium support to WordPress. Simply put, WordPress has out of this world support as compared to its Blogger counterpart. By default, Blogger comes with a limited number of themes to use. It is possible to modify the background and colors of these templates with the help of already in-built tools. However, you cannot be able to make modifications or develop new layouts. However, they also have non-official blogger templates. The only problem with these templates is that they are of low quality. WordPress has numberless templates that you can use. All of these themes are free and of premium quality. These themes allow you to create unique and professional websites. For almost every type of website on WordPress, there is a theme special for it. It does not matter your blog needs, WordPress has numerous high-quality themes that you can easily customize and modify to fit your site’s needs. There are also countless companies who make premium WordPress theme that provides exactly what you’re looking for. Take a look at our review of some of the best premium WordPress theme: GeneratePress & Marketers Delight. For a very long time, Blogger has not had any major updates. Instead, we have witnessed Google take out some of their most popular services such as Google Adsense for feeds, FeedBurner, Google Reader among others. The future of Blogger is not very promising. But its future is in the hands of Google. They reserve all the rights either to shut it or not. WordPress, on the other hand, is an open-source which means that its future is not in the hands of one company. It was created by a community of users and developers. It is famous globally and most of the major international organizations and businesses are depended on it. 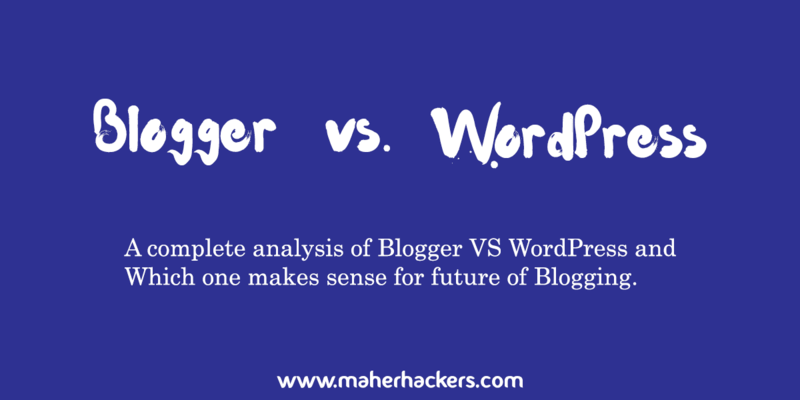 The future of WordPress, when compared to Blogger, is reassuring and bright. Simply put, WordPress is here to stay. Are you looking for a platform to help you earn a living? Well, Blogger does not have features to help you make money. The only method of making money using Blogger is by displaying your advertisement through Google’s Adsense. To reach the third party eCommerce platforms, you will have to integrate it with various selling tools. WordPress, on the other hand, comes with numerous plugins which you can use to advertise your web. It has no restrictions and therefore you can create an online storefront from where you can make money. How much will it cost you to set up a WordPress or Blogger blog? Well, it is absolutely free to set up a Blogger blog. You will use for free for life. However, it has a shared sub-domain. If you would like to remove the sub-domain, you will have to buy a new domain from a third party such as NameCheap. For you to run a blog on Blogger, you will only need to pay the yearly domain registration fee alone. For WordPress blog, on the other hand, it is only the software that is free. You will be required to purchase the host and domain name. A domain name costs only a few bucks a year. However, there are some companies such as Bluehost which offers free domain name and hosting. Bluehost (Read my full review) also offers incredible support and features in affordable pricing. Get 60% OFF Bluehost using our link. In comparison then, Blogger is cheaper because it is absolutely free. But it will cost you around $100 per annum for WordPress. But considering the features that come with it, the money is worth it. Blogger is a ready to use platform and since it is hosted by Google, you do not have to look for a host. You will also be issued with a sub-domain name (yourusername.blogspot.com) unless you purchase a different domain name. The only requirement for you to have a Blogger blog is to have a Google account. It is very easy to sign up and start a blog on Blogger. WordPress, on the other hand, is very popular for its simplicity. For you to start a blog on WordPress, it is paramount that you buy a hosting plan and a domain name. When you meet these two requirements, you will be allowed to install your WordPress on your hosting server and then connect it to your domain. Once your blog is published, you can begin posting your blogs. You can customize your blog as it seems fit to suit your blog needs. You cannot be able to add themes. But, it allows you to add third party’s scripts for you to increase some basic features. However, adding third part scripts comes with its limitations. Simply put, it is not possible to extend Blogger’s functionalities. WordPress, on the other hand, is highly flexible. This is due to the fact that it is supported by a proactive community of users and developers. It has thousands of plugins that you can use to add its functionality and features. Some of the features that you can change include contact forms, SEO, lead generation and many others. The good thing about these features is that you can change your blog into any website that you want it to be. As mentioned above, it is worth noting that there are two versions of WordPress – WordPress.org and WordPress.com. In this write-up, we are focusing on WordPress.org and the following are some of its merits. WordPress is very flexible and it has more space to grow and take your blog to another level. This platform gives you the freedom as a user to have full control, own it and run it as you want. You have the right to monetize any of your blogs on WordPress in whichever way you want. Some of the ways that you can monetize your WordPress blog is through affiliate marketing, Google Adsense among others. The platform has plugins for all functions and features. With the help of plugins, you can add as many features and make any changes to your blog even if you do not have prior coding knowledge. WordPress gives you the freedom to manage your blog from anywhere. You can manage your blog using either mobile apps that are supported by both iOS and Android, using laptop, tablet or desktop with either Windows or Mac and through the browser. This platform has a wide range of design templates which you can use to build a slick looking design without necessarily having any designing know-how. There are numerous free WordPress themes for bloggers to use. WordPress has numberless online resources where you can get help in case of any problem. There are also many people that are willing to help you. In addition to that, there are also meetups and conferences where you can obtain help for your WordPress blog. WordPress is an open-source software which has a huge and vibrant community of both designers and developers. In case you need help with designing your blog, you can easily get someone who is willing to walk with you through the process. WordPress gives you the ability to either import or export any of your content to and from other platforms. WordPress is renown for its SEO friendliness. It becomes even more friendly when it is being used alongside SEO plugins. If you are running a blog that is SEO dependent like affiliate marketing, WordPress is the right choice for you. You can use WordPress to build different kinds of websites and blogs. The number of websites and blogs that you can build is as numerous as are the themes. Needs server and Domain Name – For you to install your WordPress, you need a server to host your WordPress site and a domain name. For you to get these services, you will have to pay for a few bucks every month. It has a learning curve – In order for you to get used to using WordPress, it has a medium sized learning curve. This is due to the many technical opportunities that it has to offer. Managing responsibility – With WordPress, you are personally responsible for managing your blog’s backup, uptime and security. These are the primary features in any online site but WordPress does not provide them. Too many themes and plugins – WordPress has numerous themes and plugins. These require a lot of time for you to find out which ones are ideal for your blog’s needs. Cost – Blogger is absolutely free to use. Therefore, it is a better option for newbies. This is because you want to cut on the cost until you can be able to pay for the hosting fee for other companies. Since it is managed by Google, it is very easy to integrate its Analytics and Search Console. Besides that, if you integrate with your Google Adsense account, it will give you the freedom to add advertising banners and hence begin earning money. Moreover, if you integrate it with your Google+ account, it will allow you to post on your account and even integrate your Google+ comments. Blogger does not have plugins. However, it has a manageable number of simple gadgets which you can use to create or improve your blog’s footer and sidebar. On your template, you can do any HTML changes. You can achieve this through an interface on the browser. It is possible to make changes to the template designer. You can make simple changes such as column width, background, color, and font size. Whenever you sign up for Blogger, your URL is by default. The default URL given is yourname.blogspot.com. However, you have the right to change this default URL to your blog’s domain name. One of the main challenges of Blogger is that Google seems not to be interested in it anymore. Limited design templates – Blogger has a limited number of choice design templates. This makes it very difficult for users to create a decent blog look and feel that suits your needs and that is even unique. You must have a Google account – for you to use Blogger, you must have a Google account. This limits many bloggers who would like to use Blogger but do not Google accounts. Owned by Google – Blogger is owned by Google hence it does not give you as the user the freedom to own your content. When you do not own your content, Google can shut down your blog without explanation or warning and there is nothing that you can do. Limited – Blogger is outdated, has numerous limitations and it is not future-proof. If you have a big ambition of starting a blog such as running an online business, Blogger will not give you a conducive environment to grow. Blogger is a simple platform. It is very user-friendly such that even a newbie can manage to write very easily. Besides that, as a user, you will not have to be worried about backups, maintenance, and hosting. The major drawback with this platform is that it gives you very limited options for changing the feel and general outlook, functionality and adding extra features. In fact, Google has not developed it for a long time. The user interface of Blogger and its general usability is a bit outdated when compared to its WordPress counterpart. All these factors make Blogger not to be a good option more especially for long-term sustainability. In other words, it cannot be compared to WordPress which is constantly being improved and upgraded by a very proactive community of developers. This is why in the battle between Blogger vs WordPress, WordPress is a winner by a great margin. WordPress gives you the opportunity to create anything that your imaginative power can give you. The open source community that is behind WordPress gives you numerous features that are unique to the platform. When you decide to use WordPress, it will save you not only time but also money. This is because you do not have to create or design any function or feature from scratch. They already have design themes or plugins for everything. Most importantly, most of these themes come free of charge. You can do all this even if you are not a coding expert. It gives you the full ownership and control, feel, look and the freedom of how you want to present your content is another plus for WordPress. It is for these reasons that WordPress stand tall. The fact that WordPress gives you full control and it is very adaptable means that it has a medium size curve for learning. Additionally, you must register your domain name, manage the backup and security of your content and find a suitable host for your site. However, they have plugins that will help you in almost every process. Most importantly, are you a blogger or affiliate marketer and you want to monetize your blog? WordPress is the king of monetizing any of your online business. It gives you the freedom to use any of WordPress monetization option that suits you. If you like using Google’s Adsense on WordPress, you can do so. Which platform do you use? Comment below! Yap, good article. This is my answer. Thank u guys,info was well taken, tremendous help,but here’s my issue, I tried to purchase an online whatever, after purchase I am now told to get webhost bfore I can start making money, I am very low on cash badly in need of something to keep a shelter over my head and now have no clue how to get up and running with something to help me financially. In fact, i have no clue how to get a free sites up and running on my own, is anyone out there willing to help me get something legitimate up and running now please? Thanks. If you want a simple blog and don’t need a lot of plugins or static pages, then Blogger probably meets your needs just fine. WordPress does give you more options to customize. Many of the most popular websites use WordPress as a platform, including CNET. Thanks for the info. I have a blogger account for new home info and was considering word press. But I will try to make use of what I have. I had a blogger blog. I posted some political stuff, nothing bad at all. I wrote an article about our local news company and how they lied about some facts. Next thing you know my blogger blog was flagged as spam. Google never got back to me about it. WTF? Going blogger for any kind of serious blog, politics, fitness, techie, gaming, BAD idea. It could some day just drop out from under your nose. At present blogger is a nice blogging platform as now it is more seo friendly than previous time. After all both are good for their own features. Blogger deletes your blog if it suspects spamming or high traffic or sometimes at random. Blogger zaps thousands of blogger sites daily. They don’t give any reason why or reply to your email. Some people have already built 2 years of blog materials and thousands of flowers, and then one day, zapped!! No reason at all. You don’t even have a backup. You have to start from scratch again. It’s better to pay for your blog site than hosting it on a free site. WordPress offers a free installer so you can install it on your own server. You can customize and add gadgets just like blogger. You can even back up your materials. Blogger is too dangerous to put your blog there. One day, your blog will be gone for good. All your hardwork kaputt!! I do not like word press since it is too slow to load. It also lacks cool features for customization. …is signing up for one of these (let’s say Blogger, for now) – then depending on growth – converting the entire blog (to WordPress.org, for example) possible? I recall seeing other blogs that say “we’ve moved here…” so I’m assuming not – but worth asking. I think this is the biggest factor in my choice – would love advice! Good Information.I want to convert my blog to WordPress. It helps me decide it.